--From the NES Mega Man 2 instruction manual. Play Mega Man 2 Now! One year after Mega Man defeated the original Robot Masters along with Dr. Wily, that crazy man is back with eight new robots of his own design. His sole purpose, to get back at Mega Man for defeating him a year earlier. Now Mega Man must jump back into action and save the world from Dr. Wily's army of robot minions and the eight Robot Masters that lead them. Mega Man 2 was the most popular of the Mega Man series. It was named by GameSpot as the Greatest Game of All Time, and it made number 33 in Nintendo Power's Top 200 games list. The graphics of this game are much improved from the original, and the music as been reworked and sounds better and even catchier. 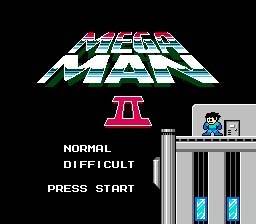 Mega Man 2 is also one of the few Mega Man games that held a contest in Japan so that the fans could participate in the design of the Eight Robot Masters. So enjoy what many believe to be the best of the best in the Mega Man series. Once again, you play Mega Man in this classic platform game, as he runs through stages fighting small and annoying robots until you get to the Robot Master. Once the Robot Master is defeated, take their power and move on to the next. As usual, you can select the new powers from the Menu. The game principles are much the same as the original Mega Man, with slight differences. First of all, the running score has been removed, along with the drops that boost your score. Now the drops only boost energy or weapon power. Also this game features the E-Tank, which allows you to build up extra energy and store it until you need it later. Use it to refill your life bar by selecting it from the Menu. Finally, this game features two more robot masters than in the original. The eight robot masters are as follows: Metal Man, Air Man, Bubble Man, Quick Man, Crash Man, Flash Man, Heat Man, and Wood Man. Each one of the Robot Masters has a weakness to another's power, which are listed in the Hints section. After defeating the Robot Masters in their individual stages, Mega Man must then go to Wily's Fortress, where he will once again face down Dr. Wily. First he must defeat the Robot Masters a second time. Only after that will Mega Man be confronted by Dr. Wily himself. Good Luck, player. Lock and Load!